We’re entering the era of mobile 2.0. With the maturation of mobile technology, today’s businesses have the opportunity to create a library of easy-to-use apps and experiences that help employees do their jobs more effectively. Apps at scale. But how do you create apps at scale? By establishing a mobile center of excellence (MCoE). 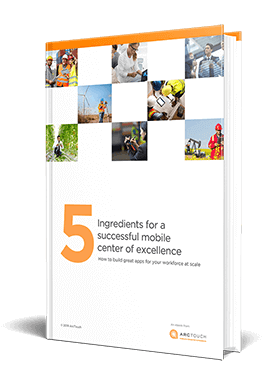 In this ebook, we share the 5 key ingredients to building a successful MCoE for your business. Understand the importance of using use platform thinking in everything you do. Take advantage of the “smart” tools available in the marketplace. Ensuring the integrity of app data is crucial — for your business and your teams. Efficiently manage the lifecycle of your apps with a defined team and consistent process. Employees expect their workplace apps to be great — not just functional.